The conference will take place at Heriot-Watt University, located in Edinburgh, the capital of Scotland. With a rich heritage stretching back to 1821, Heriot-Watt is a truly global university with a lively and vibrant academic community of over 29,000 students from more than 130 countries studying for degrees in our campuses in the UK, UAE and Malaysia. 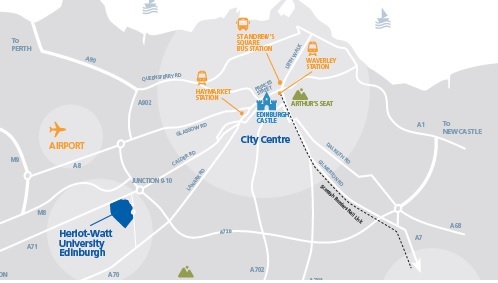 Edinburgh airport is located 20-30 minutes from the city centre by tram or bus, and just 15 minutes away from Heriot-Watt University by taxi. You can fly to Edinburgh by all major and low-cost airlines. To get to the Heriot-Watt University from the city centre you need to take bus 25 or 34. As an alternative you can stay at the COURTYARD by Marriot hotel at the university campus.